Photographer Cristobal Palma has sent us these images of Quinta Monroy residential development, designed by Chilean architect Alejandro Aravena of Elemental. Aravena was awarded the Silver Lion for a Promising Young Architect in the International Exhibition at the Venice architecture biennale this year for his work with Elemental. See all our stories from the biennale. 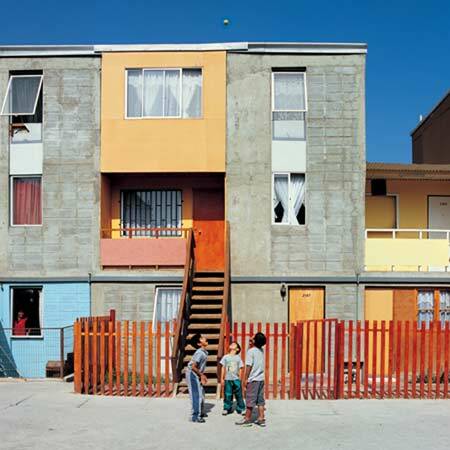 Situated in Iquique, Chile, and completed in 2004, the development includes 93 houses and was the first built project by Aravena/Elemental. B. In order to trigger a relevant qualitative leap-forward, our projects must be built under the same market and policy conditions than any other, working to achieve “more with the same”. C. By quality we understand projects whose design guarantees incremental value and returns on investment over time, in order to stop considering it a mere “social expense”. In this spirit, ELEMENTAL contributes to improve the quality of life in Chilean cities, providing state of the art architecture and engineering, understanding the city as an unlimited resource to build social equity.